eBay (EBAY) traded 8% higher on Tuesday morning, after an activist investor floated the idea of splitting the company into smaller firms. From a short-term perspective, our analysis shows that while the stock has made an important bottom, there may be better opportunities to take a position in the near future. 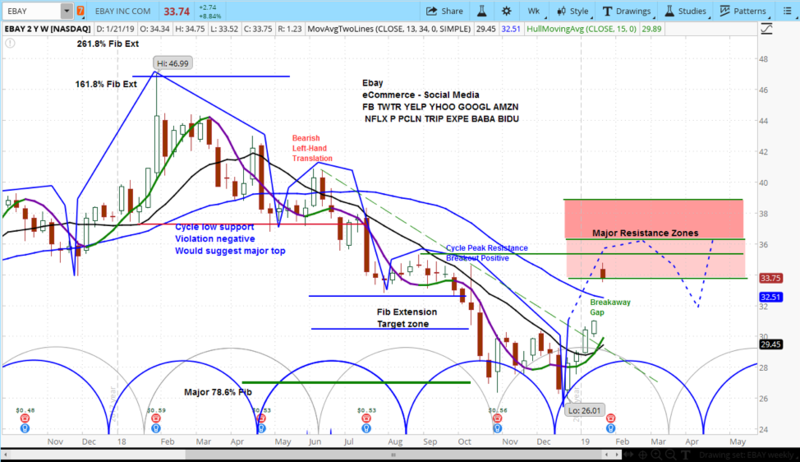 From an intermediate-term perspective, our analysis of the market cycles for EBAY shows that the stock is in the rising phase of its current cycle. We see $36 as resistance, with a pullback likely in the near term. While the stock has been in a negative pattern, indications are it has made an important bottom, which was confirmed by today’s “breakaway gap”. As such, we expect minor pullbacks, and then higher prices in the spring/summer. Elliott Management, an investment manager that owns 4% of eBay, recommended splitting the e-commerce giant into smaller firms to maximize shareholder value. Its “Enhance eBay Plan” includes spinning off ticket exchange StubHub, online classified properties, and other reforms. In a letter to eBay’s board, Elliot said, “Significant underperformance occurred despite strong end-market performance. As the broader internet universe has flourished, especially e-commerce peers, eBay’s stock has floundered.” Elliott believes its plan would double the share price.